Afghan and international narcotics experts have strongly criticised a proposed pilot project to grow opium poppy legally in Afghanistan for use in medicines. The scheme is the brainchild of the Senlis Council, a think-tank working on security, development and counter-narcotics issues. It has the backing of the European Parliament and will go to European Union foreign ministers for consideration at a meeting later this month. But while the idea is unlikely to win the support of ministers, the parliament's move has left officials in Afghanistan fuming. The Senlis Council argues that efforts to eradicate poppy cultivation haven't worked. Worse still, it says, eradication programmes have driven poppy farmers into the arms of the Taleban. So why not cut the ground out from under the feet of the warlords and the Taleban, without depriving poor farmers of their livelihoods? Why not set up pilot projects where whole villages would be licensed to grow poppy legally? It's been done successfully in India, Thailand and Turkey, so why not Afghanistan? This is the core of the Senlis proposal. The poppy would be processed into morphine for medical use, using laboratories based in Afghan villages. The licences would be given to villages, not individual farmers. If one farmer sold poppy for heroin, the whole village would lose its licence. This is the model followed successfully by microfinance projects elsewhere. Norine McDonald of the Senlis Council says it's the only viable alternative. Poppy cultivation is increasing; efforts to switch farmers to alternative livelihoods have been unsuccessful. 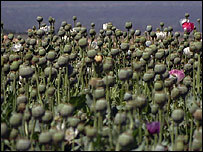 Southern Afghanistan, where most of the opium poppy is grown, has suffered from a drought for several years. Poppy is a notably drought-resistant crop. Farmers would need expensive irrigation systems to switch to other crops, she says. "The idea that southern Afghanistan has an agricultural future is false," she argues. "By allowing pharmaceutical processing at village level, young men can be trained for light industrial work. This is important for the future of Afghanistan." But officials working to stem the opium trade from Afghanistan are appalled. "Poppy is supporting terrorism and drug dealers," says Afghanistan's acting narcotics minister, Khodaidad (who, like many Afghans, has only one name). "The Senlis Council and the European Parliament are supporting insecurity in Afghanistan." Afghanistan's mullahs issued a fatwa (decree), saying people must not grow poppy because it is haram (forbidden in Islam), he says. 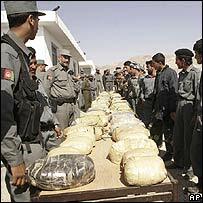 Opium is banned under the Afghan constitution, and the government opposes any form of legalisation. Licensing the sale of poppy for medical purposes won't get rid of the demand for illegal opium, warns a British narcotics official in Afghanistan who preferred not to be named. In fact, he believes it would just create a new cash crop for farmers, meaning that even more opium would be grown. Many farmers grow poppy under duress, he points out. 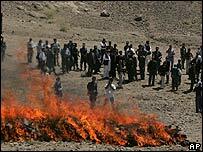 The Afghan police would be hard-pressed to stop drug traffickers from forcing farmers to divert part or all of their crop for heroin. "Afghanistan needs a rule-of-law structure to stop people growing opium," he says. "But if it had a rule-of-law structure, it wouldn't have an opium problem in the first place." A European Commission (EC) document obtained by the BBC argues that buying poppy from farmers could have a perverse effect. "Farmers could see this as an incentive to further expand production. This would not be an appropriate use of resources for the international donor community or the Afghan government." And the UN Office on Drugs and Crime (UNODC) has serious reservations. "At the moment, in the Afghan context, any proposal should be taken with utmost caution," says Jean-Luc Lemahieu, the head of UNODC's Europe and West and Central Asia desk. The idea of laboratories in the villages is problematic, he says. "Where will the precursor chemicals [needed to convert poppy into opiates] come from, and who will control them?" he asks. "Who would ensure they're not diverted to other frameworks?" The Senlis Council says there's a shortage of medical opiates on the world market, especially in developing countries, which Afghanistan can fill. But the British narcotics official disputes this. The International Narcotics Control Board, which licenses countries to produce opiates legally, has a two-year surplus, he says. "Developing countries don't have opiates, but they don't have penicillin or aspirin, either," he adds. And he questions the economic benefits the Senlis scheme would bring. The price of legal opiates on the world market is $35 to $40 a kilogram. Illegal opiates fetch nearly three times as much, around $100 a kilo. The EC says "exorbitant subsidies" could be needed to bridge the gap between legal and illegal prices. In the end, the British official says, poppy-for-medicine would undermine the authority of the Afghan government. It would be impossible to justify allowing one village to grow poppy under licence while eradicating the same crop just a few kilometres away. Counter-narcotics experts acknowledge that similar schemes have worked in other countries which used to have a serious drug problem, such as Pakistan and Thailand. But Afghanistan, they say, just isn't ready. With violence and instability still wracking the country, they fear that any move to legitimise poppy production could make a bad situation even worse.